Richard Foston Plastering Services are a small reliable firm - a friendly time served professional plasterer in Sleaford. We offer a clean, prompt and reliable service with a firm commitment to customer satisfaction. Price and quality are the key to our continued success and the reasons why so many of our customers come back to us time and again, and recommend us to their friends and colleagues. Our prices are extremely competitive and we are willing to take on any job regardless of size or scale. Richard Foston is a leading plasterer in Lincolnshire offers a wide range of plastering services. 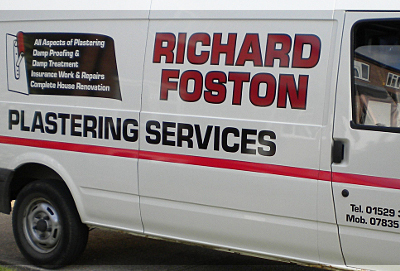 Richard Foston is a professional plasterer in Lincolnshire is based in Sleaford and covers Grantham, Newark, Boston, Lincoln and surrounding areas.